Clare Grove’s exquisitely illustrated books ‘My Mummy Loves Shoes’ and ‘My Mummy Loves Bags’ are guaranteed to bring a smile to the face of even the most fashion-fearing, fatigued multi-tasking mother, yummy or otherwise. Each page of these beautifully presented, gently humorous treasures takes the reader on a whimsical journey through mummy’s collection of footwear and handbags, from the sensible to the simply sublime. Clare’s first book about shoes is one for fashionistas who will enjoy playing spot the Choos, Manolos or Miu Mius amongst jewel-encrusted moon lit skies and tropical rainforests, and for the children, there’s a little red shoe hidden on each page. Following the success of ‘My Mummy Loves Shoes’, Clare wrote and illustrated ‘My Mummy Loves Bags.’ Prepare to fall in love again and be enchanted with this visual delight, as the author takes a little girl and her Mummy on a magical journey across the globe, from London to Paris, to New York and Sydney, via flower-filled meadows and even the ocean floor! Mummies will marvel at Grove’s simply exquisite illustrations, while little readers will delight in finding the tiny treasures from mummy’s bag hiding on each page. Clare’s delightful stories are ultimately about more than just shoes and handbags, they are an illustration of love. A must for every grown up little girl who remembers the world of magic within mummy’s wardrobe, and perfect for sharing with the next generation of little feet tottering about in mummy’s heels and carrying a handbag. Illustrator Clare Grove creates her books for children, but there’s little doubt the fashion-mad grown-ups who read them enjoy them just as much. For the Love of Shoes. This is one of the prettiest books we’ve seen in a long time. 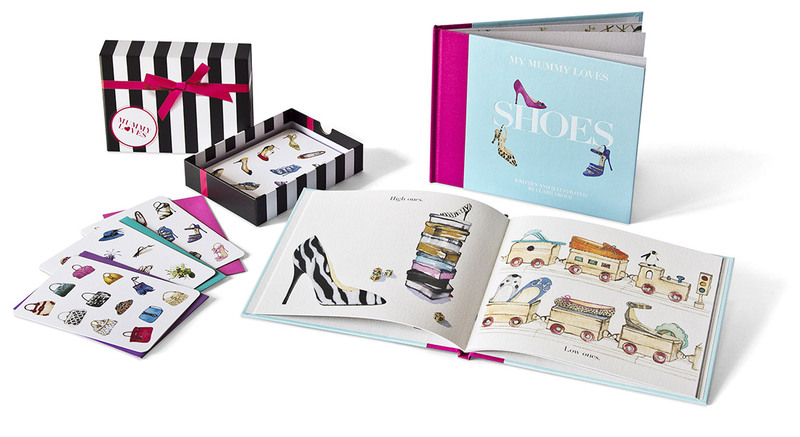 Your little fashionista can hunt out the small red shoe hidden on each page, while you ogle the exquisitely illustrated Jimmy Choos and Manolo Blahniks.